When I saw the original recipe for this dish in my current issue of Sunset, I immediately tore it out and planned on making it, pronto. After a closer look at the nutritional data, I was floored by the high calorie count and puzzled by the promised 4 servings from only 8 ounces of dried pasta. My usual guide for pasta is 4 ounces per person for an entrée portion. I doubled the oil and added some butter, used leeks instead of onion because they felt more like “springtime”. I halved the amount of prosciutto to watch the salt level and added lemon zest to make the flavors pop. Chili flakes are served on the side at our house, since Larry chokes on peppery accents. I always add cooked pasta to the sauce while it is still on the stove, so I played a bit with the method outlined in the original recipe and came up with my Springtime Asparagus Pasta. TIP: Break the pasta in half before cooking it. Your guests will thank you for keeping slurping at a minimum. 1. Heat water for pasta in a large covered pot. 2. Using a large skillet, heat the oil and butter. Add the leeks and mushrooms. Cook, stirring, for 5 minutes over medium-high heat. 3. Lower the heat to medium, add the garlic, prosciutto and asparagus. Cook, stirring, until asparagus is just tender, about 5 minutes. 4. While the asparagus is cooking, add the pasta to the boiling water and cook for 3 minutes. Drain pasta and add to asparagus mixture. 5. Add the lemon zest, parmesan, salt and/or pepper. Stir and cook over medium-low heat for 2 minutes. 6. Turn onto a warmed platter, garnish with additional parmesan and/or red chili flakes and serve. This is so bright and pretty; I love your adaptations. Perfect spring fare. Liz – I love the colors in the photo – it almost made me believe it’s spring! I also love your changes to the recipe – we stay away from anything with that much heavy cream both because of the fat and calories and the lactose. But who needs it anyway! We truly did not miss it – I think the cream would have overwhelmed the dish. Love your lighter fresher version, it’s a beautiful dish and stunning photo! Thanks, I think I will be playing with the ingredients into the summer – such a quick dish. Oh Liz! The photo is gorgeous 🙂 I really enjoy asparagus, I usually make it with eggs and parm, this looks really good. Thanks for your inspiration. Thanks, Wendy, I really enjoyed your post on the Edible weekend – and your photos. Kudos to you for making the changes that work for you and Larry! Kim, I never even mentioned the cream to Larry – tricky, yes? I’m going to try this as soon as possible. I love the mix of flavors and colors. Nice job! This is the kind of dish I live for. I can’t wait for our local asparagus to arrive so I can make me a BIG pot! This looks just lovely, and I definitely vote for your improvements. Heavy cream isn’t needed at all. 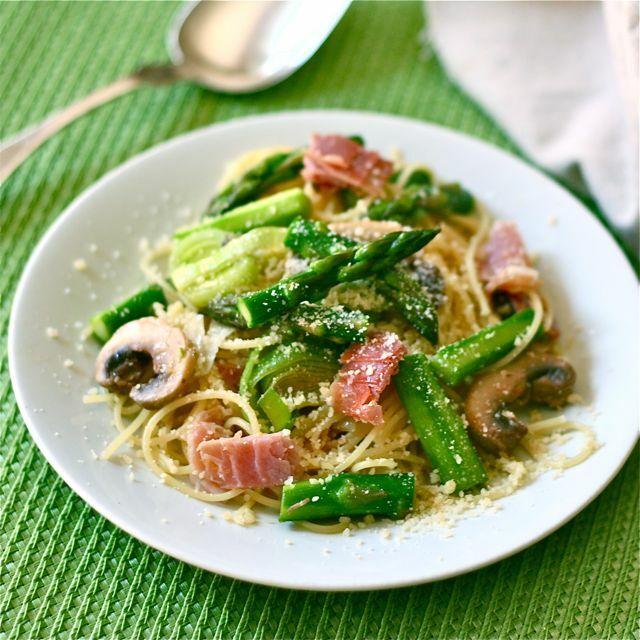 Love the way the green placements make the green asparagus really pop out! Thanks, Susan and see you at the next Blog Hop. This felt like a very Susan aka the wimpy vegetarian recipe to me – hope you try it. Lovely picture! This sounds great, indeed very Spring like! Asparagus season is about to start here! Thanks, Jayne, I could eat asparagus every day – my favorite vegetable, I think.